ASHEVILLE NC – Acu-Roast of Acupuncture Pioneer, Cissy Majebe, Tuesday, April 17th, 6:30 – 10 p.m. at Highland Brewing Company, 12 Old Charlotte Hwy, Asheville, 28805. Come celebrate acupuncture pioneer, Cissy Majebe’s, 60th with Asheville‘s first ever “acu-roast”! Live music, dancing, beer, light appetizers and non-alcoholic beverages included with your donation at the door. All proceeds benefit Traditions Acupuncture Foundation which provides Chinese medical care to underserved populations in our area. $25 per person suggested donation. To help or for questions, e-mail [email protected] or call 231-6222. For a complete list of items which can be recycled versus those which can’t, visit www.curbie.com. ASHEVILLE NC – The pre-eminent hip hop dance company in the world. Puremovement is pure, contagious stage magic, a celebration of life, or as The Village Voice describes their show: “Hip hop dance to a higher power, in both the mathematical and the metaphysical senses.” Under Harris’s artistic direction, Puremovement’s virtuosic dancers stretch brilliant street moves to high art in works that beat with meaning and delight. This company is the international ambassador of hip-hop dance, delivering the true essence and spirit of hip hop, rather than commercially exploited stereotypes. Book your seats early for this remarkable and powerful group – and don’t miss the chance to bring your teens and their friends with you. Click here for a feature article about Rennie Harris Puremovement in the Asheville Citizen-Times. Click here to read the Mountain Xpress‘s write-up about Rennie Harris Puremovement. We love this video of Dinita “Princess Di” Askew freestyling various hip-hop and funk styles – check it out! February 23 & 24, 2012 • 8:00 p.m.
ASHEVILLE NC – A-B Tech’s Holly Library is pleased to host Inner Earth Illuminated: Caves of the Southeastern United States, a photographic exhibit by Alex Minkin. Instructor Rock Doddridge says that “Alex was a dual enrolled student here in spring of 2006. He took Psych 150 with me, doing a superb job. His father is a surgeon with Carolina Hand Surgery. Alex has committed himself to maximizing his talents and interests, and living life fully.” Alex earned his BFA from Guilford College in 2011. The library will host a reception for Alex at noon Monday, March 5 in Holly Lobby. The exhibit runs March 5 through April 27. ASHEVILLE NC – Save the date for “Wonderfully Made,” a Music for Life benefit concert to support Open Arms Crisis Pregnancy Center in Hendersonville. The interdenominational concert will take place on Friday, March 16 at 7:00 p.m. at the Fletcher Seventh-day Adventist Church at 1141 Howard Gap Road. The program – which will be focused on the theme of Psalm 139:13-15 – will include music by a mass children’s choir, a mixed adult/high school choir, and local instrumentalists. A harp prelude will begin at 6:45 p.m.
About Open Arms: Open Arms is a non-profit, Christ-centered, nondenominational organization designed to meet the needs of women and teens who require pregnancy support in Hendersonville, N.C., and its surrounding counties. The center is staffed by volunteers and an executive director who consults with professionals including doctors, lawyers, psychologists, clergymen and social workers. Clients are also referred to other community agencies as needed. The essence of this ministry is love. The aim is to support and guide. The purpose is to serve God and preserve life. To learn more about the ministry of Open Arms Crisis Pregnancy Center, please visit: www.openarms329.com. Park Ridge Health was built by Henderson County residents, and more than 100 years later, they are still a beloved piece of the growing community’s health care network – providing quality, compassionate care in a Christian environment. In 1986, Park Ridge partnered with Adventist Health System, joining more than 43 exceptional not-for-profit community hospitals in the U.S., and leading the way in many medical firsts for the region. For more information about Park Ridge Health or to find a physician, please visit parkridgehealth.org or call 855.PRH.LIFE (774-5433). ASHEVILLE NC – The Cherokee Language Program at Western Carolina University is collaborating with EarlyLight Books of Waynesville to publish a bilingual and Cherokee-only version of a book titled “Animal Colors,” which is designed to teach early readers about colors and animals. The book has already been translated into the Cherokee syllabary, is scheduled to print in February and should be available to the public in July, said Dawn Cusick, owner of EarlyLight, which specializes in science books for children and adults. The development is significant because it is the first step in a partnership that will help the Cherokee Language Program move away from self-publishing books and focus more on the work of language, said Hartwell Francis, program director. Francis and program coordinator Tom Belt worked together to translate and edit the book’s original text by Beth Fielding. The book was designed with the unicode font “Aboriginal Serif,” available for free download from languagegeek.com. The Cherokee Language Program helps produce materials for a Cherokee language immersion program on the Qualla Boundary for children from 6 months old through second grade. The program is an effort to keep alive the Cherokee language after findings indicated a small percentage of fluent speakers remained among members of the Eastern Band of Cherokee Indians, and that most of the remaining speakers were older than 51. In the past, the Cherokee Language Program has produced two books in the Cherokee language, “Grouchy Old Woman” and “Spearfinger,” both based on Cherokee legend. It also has produced children’s books with the Eastern Band’s Kituwah Preservation and Education Program, which oversees the immersion program’s early childhood component and primary grade classrooms, called the Kituwah Academy. In addition, the Cherokee Language Program also has put books online in video form and that can be printed by individuals and is working with WCU programs in entrepreneurship and computer information systems to develop a Cherokee language learning application for mobile devices. For more information, contact Francis at [email protected] or 828-227-2303. ASHEVILLE NC – The Vienna Boys Choir, among the most celebrated choirs of all time, will perform at 7:30 p.m. Tuesday, March 6, at the John W. Bardo Fine and Performing Arts Center at Western Carolina University. The choir, founded in 1498, has a repertoire that includes medieval, contemporary and experimental music. Long a fixture in Austrian musical life, until 1918 the choir performed only for imperial courts, in church and at private functions. Now, four choirs of 24 schoolboys between the ages 10 and 14 and from Austria and neighboring European countries perform hundreds of times a year worldwide. The performance is part of WCU’s seventh annual Galaxy of Stars Series and is sponsored by MedWest Carolinas HealthCare System. The final Galaxy of Stars show is “That Mancini Magic” on Sunday, April 29, when renowned pianist Mac Frampton and Cecil Welch, Henri Mancini’s solo trumpeter for 20 years, bring the great American composer’s cherished melodies to the stage. Ticket prices for the Vienna Boys Choir are $20 for adults and seniors; $15 for WCU faculty and staff; $10 for groups of 20 or more; and $5 for children and students. For more information, or to purchase tickets, contact the Bardo Arts Center box office by phone at 828-227-2479 or online at bardoartscenter.wcu.edu. February is recognized as a time to celebrate love, caring, and heart health, so what better time to improve your own heart health or help loved ones improve theirs by quitting smoking? As indicated in the 2010 Surgeon General’s Report, How Tobacco Smoke Causes Disease: The Biology and Behavioral Basis for Smoking-Attributable Disease, cigarette smoking greatly increases one’s risk for heart disease. Being smoke-free and eliminating exposure to secondhand smoke are important to heart health. 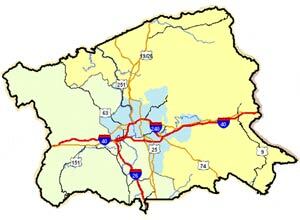 ASHEVILLE NC – Have you been wondering how the new political districts will affect you? Buncombe County GIS and the Office of Election Services have teamed up to make that information easy for you to find. The new district information, as approved by the North Carolina Legislature for Congress, State House and State Senate districts, is now searchable by your address or Parcel Identification Number (PIN). Find the location of your polling place and your current representative. Find out which County Commission District you are in by checking out the State House District map. ASHEVILLE NC – Clarinetist and faculty member Shannon Thompson will perform at 7:30 p.m. Tuesday, Feb. 21, in the recital hall of the Coulter Building on the campus of Western Carolina University. The performance, part of the Catamount Concert Series, is free and open to the public. The music for the concert spans a wide range of musical styles, and includes “Five Bagatelles” by Gerald Finzi; a popular transcription of George Gershwin’s preludes for piano arranged by James Cohn; Pulitzer Prize-winning composer Leslie Bassett’s “Soliloquies” for solo clarinet; “Sholem-alekhem, rov Feidman!,” a tribute to klezmer great Giora Feidman by the Hungarian virtuoso clarinetist Bela Kovacs; and Bach’s Sonata in G minor. For more information about the performance, call the WCU School of Music at 828-227-7242. You are currently browsing the Asheville NC News blog archives for February, 2012.